And I can’t stop thinking about candy. We don’t get many trick-or-treaters in our neck of the woods. But I always pick up a few bags of goodies to have on hand. I also decided to try my hand at making handmade goodies to share with friends and family, with hopes of freezing half for future holiday celebrations. These pumpkin graham bon bons are really simple to make – and the kids can totally make them, too! Warm the white chocolate chips, pumpkin puree, cinnamon, cloves, ginger, and nutmeg in a small sauce pan. Stir things gently until the mixture becomes smooth and melty. Turn off the heat and pulverize the graham crackers either by inviting the kiddies to pound a few in a zip top back or by blending the graham crackers in the blender. About four to five crackers usually end up to be about 1 cup. Now add the ground graham crackers to the white chocolate and pumpkin mixture and give a good stir. Pop the mixture into the fridge and let cool for a bit. Line a sheet pan with tinfoil and scoop the pumpkin graham filling by small spoonful (about 1-inch in size) onto the pan. Place the small tasties in the freezer for about two hours. Slowly melt the semi-sweet chocolate chips in a double boiler or the microwave. Get out a wooden or metal skewer, or even some toothpicks, along with the pumpkin graham balls from the freezer. Carefully skewer one ball and then swirl in the melted chocolate, covering the entire thing in yummy goodness. Carefully slide the bon bon back onto the tinfoil lined sheet tray and continue skewering and coating until the bon bons are finished. If needed, re-heat the melted chocolate as needed. Place the bon bons in the fridge to harden up and then enjoy! 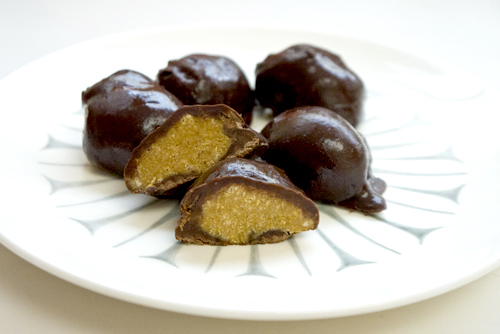 My husband, who is not a big sweets person, said they tasted just like pumpkin pie coated in chocolate.